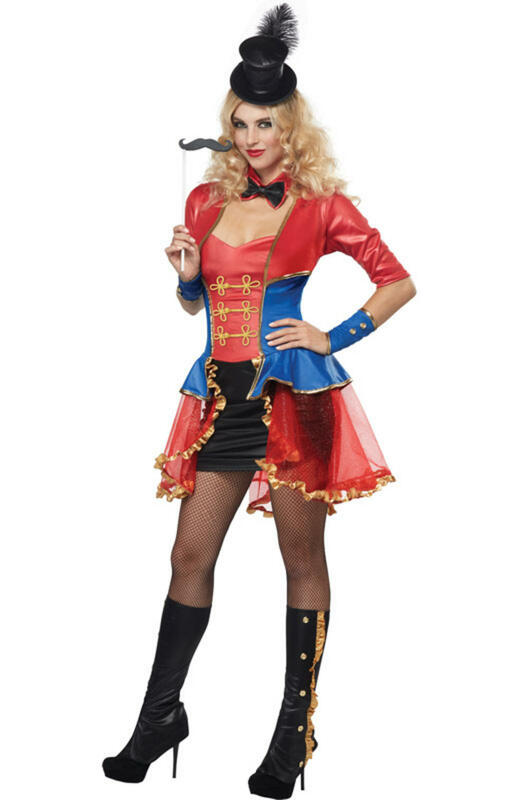 Direct all the cirque sinister fun with this beautiful Ladies Ringmaster costume, a dark twist on a fun classic. Included is a short tight fitted dress featuring a red bodice with gold detailing, a tight black attached skirt styled with shimmer glitter red peplums either side of the skirt trimmed with gold frills, attached to the dress is a red and blue shrug. Finishing this circus fancy dress is a pair of blue arm cuffs with gold trim, black leather look boot covers, a neck bow tie, a mini top hat styled with a black feather and lastly, a black plastic moustache which sits on a stick for that fun carnival appearance you're looking for this 31st October! A unique costume great for wearing to a Halloween or Circus themed fancy dress party.